The Book of Baruch, occasionally referred to as 1 Baruch, is a deuterocanonical book of the Bible. Although not in the Hebrew Bible, it is found in the Septuagint and in the Vulgate Bible, Eritrean/Ethiopian Orthodox Bible and also in Theodotion's version. It is grouped with the prophetical books which also include Isaiah, Jeremiah, Lamentations, Ezekiel, Daniel, and the Twelve Minor Prophets. It is named after Baruch ben Neriah, Jeremiah's scribe. 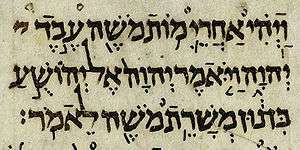 Some scholars propose that it was written during or shortly after the period of the Maccabees. In the Vulgate, the King James Bible Apocrypha, and many other versions, the Letter of Jeremiah is appended to the end of the Book of Baruch as a sixth chapter; in the Septuagint and Orthodox Bibles chapter 6 is usually counted as a separate book, called the Letter or Epistle of Jeremiah. Lk 13:29 bears relation to Baruch 4:37. Jn 3:13 bears relation to Baruch 3:29 (ibid.). 1 Cor 10:20 bears relation to Baruch 4:7 (ibid.). Jn 1:14 bears relation to Baruch 3:38 (numbered 3:37 in most modern translations) as well as to Lev 26:11–12, 1 kg 8:27, and Psalms 85:9. Athanasius, Cyril of Jerusalem, Epiphanius of Salamis and Pope Innocent I listed as Canonical book the Book of Baruch. The Synod of Laodicea (in 364) declared Baruch as canonical book. The same happened with the Synod of Hippo (in 393), followed by the Councils of Carthage (in 397 and 419). Later, Augustine of Hippo (C. 397 AD) would confirm in his book On Christian Doctrine (Book II Chapter 8) the canonicity of the book of Baruch. The Decretum Gelasianum which is a work written by an anonymous scholar between 519 and 553 contains a list of books of Scripture presented as having been made Canonical by the Council of Rome under Pope Damasus I, bishop of Rome 366-383. This list mentions the book of Baruch as a part of the Old Testament Canon. In the Catholic Church, Bar 3:9–38 is used in the liturgy of Holy Saturday during Passiontide in the traditional lectionary of scriptural readings at Mass. A similar selection occurs during the revised liturgy for the Easter Vigil. St. Augustine's reflection, which is paired with this reading, on this occasion speaks of prayer: "[S]ince this [that we pray for] is that peace that surpasses all understanding, even when we ask for it in prayer we do not know how to pray for what is right..."; from there he explains what it means that the Holy Ghost pleads for the saints. Bar 3:9–15, 24–4:4 is a liturgical reading for the Saturday of the same week. The theme is that the salvation of Israel is founded on wisdom: "Learn where prudence is, ... that you may know also where are length of days, and life, where light of the eyes, and peace. Who has found the place of wisdom, who has entered into her treasuries? ... She is the book of the precepts of God, ... All who cling to her will live... Turn, O Jacob, and receive her: ... Give not your glory to another, your privileges to an alien race." Paired with this on the same day is a reading from St. Peter Chrysologus, d. AD 450, who quotes the Apostle: "let us also wear the likeness of the man of heaven". In Summa Theologiae. III 4 4, Doctor of the Church Thomas Aquinas quotes Baruch 3:38 to affirm that "the Son of God assumed human nature in order to show Himself in men's sight, according to Baruch 3:38: 'Afterwards He was seen upon earth, and conversed with men.'" This is part of his discussion of "the mode of union on the part of the human nature" III 4. He quotes the same passage of Baruch in III 40 1 to help answer "whether Christ should have associated with men, or led a solitary life" III 40. Baruch 6 is quoted in CCC as part of an exposition against idolatry. During the Diaspora the Jews lamented their lapse into idolatry, and their repentance is captured in the Book of Baruch. ↑ "Baruch" by P. P. Saydon, revised by T. Hanlon, in A New Catholic Commentary on Holy Scripture, ed. Reginald C. Fuller, Thomas Nelson, Inc. Publishers, 1953, 1975, §504j. The same source states that "[t]here is also evidence that Baruch was read in Jewish synagogues on certain festivals during the early centuries of the Christian era (Thackeray, 107-11)," i.e. Henry St. John Thackeray, The Septuagint and Jewish Worship, 1923. ↑ Reginald C. Fuller, ed. (1975) . A New Catholic Commentary on Holy Scripture. Thomas Nelson. , §504h. Also, "late Babylonian"; "alluded to, seemingly, in 2 Mac 2:1–3" in The Jerusalem Bible, 1966, p. 1128. ↑ "Deuterocanonical Books In The New Testament". Scripture Catholic. Retrieved 2014-08-25. ↑ of Alexandria, Athansius. CHURCH FATHERS: Letter 39 (Athanasius). newadvent. Retrieved 14 October 2016. ↑ Archived 5 April 2004 at the Wayback Machine. ↑ "The Thirty-Nine Articles". Anglicans Online. 15 April 2007. Archived from the original on 25 June 2007. Retrieved 2014-08-25. ↑ "Lectionary for Anglican Church at". Bcponline.org. Retrieved 2014-08-25. ↑ Archived 6 June 2004 at the Wayback Machine. ↑ Archived 6 April 2004 at the Wayback Machine. ↑ "Dogmatic Constitution on Divine Revelation - Dei verbum". Vatican.va. Archived from the original on 31 May 2014. Retrieved 2014-08-25. ↑ "§2112". Vatican.va. Retrieved 2014-08-25. Chisholm, Hugh, ed. (1911). "Baruch". Encyclopædia Britannica (11th ed.). Cambridge University Press.